The global human population is expected to increase by almost three billion beyond the current level by 2050, with the United Stated expecting an increase in over one hundred million, half of which is expected to occur in coastal regions *1. The increased pressure this will have on marine ecosystems has yet to be addressed. In 2000, the National Marine Fisheries Service in the United States estimated that 9.1 billion pounds of fish were landed by commercial fishermen (this doesn’t even include by-catch and discards) and 613.9 million fish were taken by recreational fishermen, 254.2 million pounds of which were kept or released dead *2. 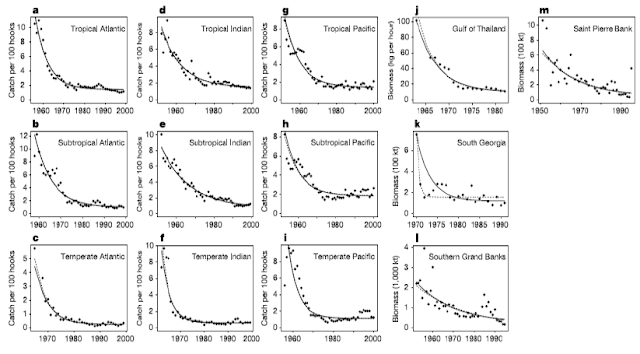 Since the introduction of industrialized fishing in the 1950’s, fish catches have declined worldwide. Estimates show that more than 90% of the large predatory fish has been lost globally *3. 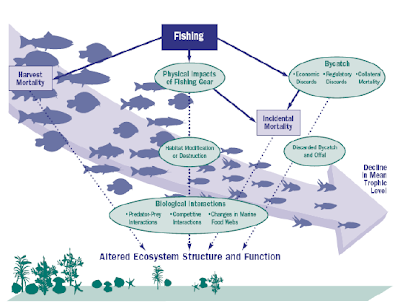 Some scientist have indicated that the total global collapse of fisheries will occur in 2048 *4, while others speculate it to be much sooner in the year 2014 *5. The ripple effect caused by over-exploitation of one species, affects the whole food web and functional diversity of an ecosystem. The removal of top ‘apex’ predatory species like wolves, sharks, and large cats, such as lions and cougars, has caused an increase in ‘meso-predators’ *6. The removal of wolves for example, an apex predator, has lead to an increase in coyotes, a meso-predator. Filling the same niche as the wolves, coyotes are far better at withstanding human controls on their populations and are a far worse pest to the ecosystem *6. 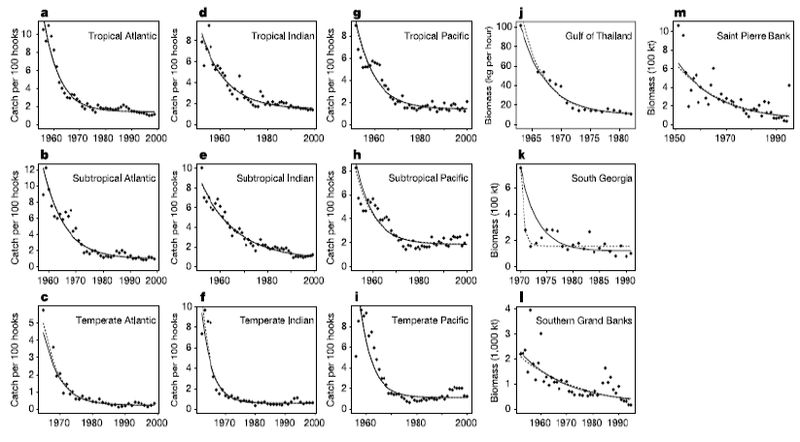 Likewise, the decline in shark populations due to overfishing has allowed cownose ray populations to bloom. Sharks kept populations of cow nosed rays stable; however, with the removal of the apex predator the ray population exploded. The cownose rays now consume much of the bay scallops and in North Carolina the bay scallop fishery collapsed and has now been closed since 2004 *7. 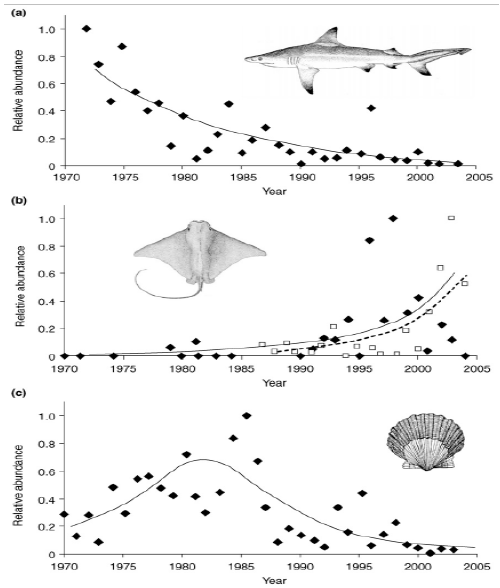 In the last ten years the cownose ray population has grown ten times more that what it once was and the shark population has closely dwindled *7. In turn, sea grass beds have also been deteriorated by cownose rays that forage through them in search of food, negatively impacting the habitat and marine biodiversity of that ecosystem. Having a high level of prey diversity reduces the direct effect consumers have on the trophic cascade by giving them a wider range of diet. This reduces the top down influence that consumers have on levels of prey resources *9. The meso-predators that are stepping into the niches left behind by the loss of apex predators are often omnivorous *6. This is resulting in the reduction of prey diversity and ultimately total biodiversity *9. The effect of losing top predators in ecological communities can lead to secondary extinctions, though these are often hard to predict because ‘of indirect interactions among species takes time to manifest themselves’ *10. Reference: *7 Auld, A. (2007). The lone shark effect has its price: Overfishing of ocean predators takes a devastating toll on the marine food chain. - Canadian Press (no longer accessible). Resources: Over-exploitations is really an issue of The Tragedy of the Commons. TOC homework, w/smurfs!, TOC video, a game. Do you agree that "freedom in a common brings ruin to all"?